+ New look for Julian’s website! + South Street Seaport Museum reopens – Julian gave a lecture there on his US tour a few years back. Take a peek at the stunning cover for Julian’s next book, published in October. In addition to the hardback and ebook there will also be a Collector’s Set. We are accepting pre-payment now and all those who pre-pay before February 28 will be entered in a draw for a full refund of their purchase! + One of Scotland’s great naval sons! There’s still time to check out the Thomas Cochrane exhibition at the National Museum of Scotland, Edinburgh. It closes February 19. Over on Julian’s Facebook page we’re focusing on a different Kydd title each fortnight. With the new Facebook format it’s easy to scroll down and see all the postings. And Julian welcomes requests to become a Friend. David, who is blind and partially deaf, read CONQUEST before he travelled to Africa and wrote a short review of the book for The Big Issue, praising Julian’s “stunning portrayal of the African coasts and its perils” – and “the way he brings his characters to life”. Tenerife, the highest of all the Atlantic islands, is part of the Canaries group and lies off the west coast of Africa. It was one of the locations the Stockwins visited recently where they learned of a number of historic connections the Royal Navy has with the island. In April 1657, Admiral Blake attacked the Plate Fleet at Santa Cruz. The Plate Fleet brought silver bullion from South America back to Spain. In a brilliant series of manoeuvres in the face of cannon fire from the Spanish and land batteries, Blake destroyed all the vessels at anchor in the harbour, without sustaining significant loss. Regrettably, though, the treasure had been hurriedly taken inland. Blake’s victory established England as a leading naval power and parliament voted to reward him with a jewel worth GBP 500. But worn out by many years at sea and in declining health, he never made it back and died just before reaching Plymouth Sound. Julian remembers that under training in the Navy he was in fact first mustered in Blake division! Some 50 years later during the War of the Spanish Succession Admiral Jennings attempted to take the island but encountered heavy gunfire from shore batteries; his fleet suffered many casualties and was forced to retreat. In July 1797 Horatio Nelson with a small force of ships attacked Santa Cruz hoping to capture a Spanish treasure ship. After two unsuccessful attempts Nelson himself led the final sortie, a daring cutting-out expedition but was repulsed. It was here that he was so seriously injured in his right arm that it had to be amputated. “The Royal Australian Navy is planning to snap up some of the 5,000 personnel from the Royal Navy set to lose their jobs as part of defence cuts. While I am very concerned about the effect this will have on the Navy I do have personal experience of moving Down Under and serving in the RAN. After my time at the sea training school ‘Indefatigable’ I joined the Royal Navy as a naval shipwright. When my parents emigrated to Australia I decided to follow them. Transferring to the Royal Australian Navy was remarkably easy. After speaking to my divisional officer, wheels were set in motion and I soon found myself on a DC 10 flying out to Australia, finding a new home in Sydney at HMAS Nirimba. Apart from some initial good-natured ribbing for the bad luck of being a Pom, I was welcomed as a fellow seaman and greatly enjoyed my service in the RAN. The practices of both navies were (and I believe still are) very similar. The main difference was the beat. While the RN is mainly Atlantic-facing their Australian brothers are more concerned with the ‘Near North’ and the Pacific where – give or take the odd typhoon – the weather is much kinder. There were challenging times, of course. I saw two years service in the Vietnam war and was aboard the carrier ‘Melbourne’ during her disastrous collision with ‘Voyager’ which left 82 men dead. But what I think I most like to remember are tropical moonpaths over the water during a night watch, banyans on uninhabited South Sea islands and going ashore in exotic locales all over the Far East with my shipmates. For a chance to win a book of your choice from the impressive range of nautical offerings at Seafarer Books, in which English county is the publisher based? 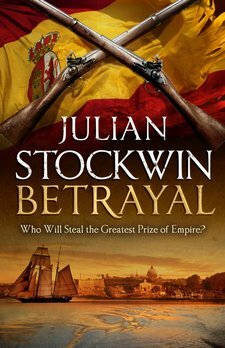 Email admin@julianstockwin.com with your answer, postal address and book choice. The first correct entry drawn wins! Marius Moolman aka Axeonalias, who lives in Pietermaritzburg, South Africa, has been busy building a virtual “L’Aurore” using Vehicle simulator Framework (an upgrade of Virtual Sailor 7). So far he has spent around 300 hours on the project. Once fully finished, quite incredibly you will be able to step aboard and walk around all her decks, visit any of the cabins onboard, take the helm etc. The talented modeller says he has enjoyed all the books in the Kydd series but the longboat voyage in SEAFLOWER across the Carribean particularly stuck in his memory. This is the third edition of the large format annual that replaced “Model Shipwright” magazine. This year’s feature articles range from an interview with Simon Stephens, Curator of the Ship Model and the Full Size Boat Collection at the National Maritime Museum to an article on firing broadsides in British men-o’-war by Peter Goodwin, to Malcolm Darch’s piece on his model of the 38-gun frigate “Minerva”. The album will not only appeal to ship model enthusiasts but to a broader audience interested in marine art, maritime research and historical interpretation. When Julian served in the Royal Naval Reserve he was very much involved with the deployment of merchant shipping in times of hostilities so this title particularly caught his eye.Over 70 merchant ships sailed with the Task Force sent by Brtain to recapture the Falkland Islands in 1982 yet remarkably little has been written about the part played in that conflict by the Merchant Navy. This book brings to life that role as seen from the decks of the ships flying the Red Ensign – and is a fitting tribute to those courageous mariners who served the nation 30 years ago. This is a fully revised and updated third edition of “Jackspeak: The Pusser’s Rum Guide to Royal Navy Slanguage” which first came out in 1989. With over 4000 terms defined, along with examples of common useage, this wonderful tome deserves a place in the library of anyone, civvies included, with an interest in the Royal Navy, the Royal Marines, the Submarine Service and the Fleet Air Arm. Or just those who appreciate the eccentricities of the English language! Delightfully illustrated by “Tugg”.